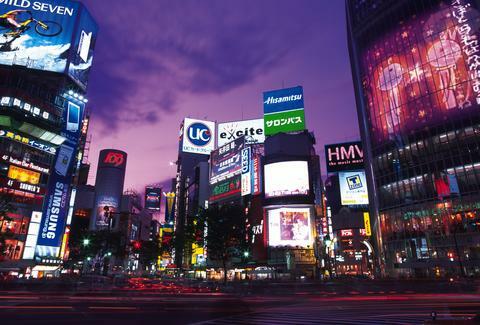 Tokyo's got a lot going for it: Not only is it home to geishas and vending machines selling beer and sake, and the only place where Scarlett Johansson will go out with Bill Murray. According to a TripAdvisor survey polling 54,000 users who vacationed in urban getaways last year, Japan's capital is also the world's best city for travelers. Scoring high marks for being kind to tourists, having pristine streets, a stellar public transit and taxi service, Tokyo -- which claimed first place as the city with the best overall experience -- appeared in the top 10 of 13 of the survey's 16 criteria. It's the Dan O'Brien of vacation destinations. Among the other cities popular with travelers, New York City, which was the only American city to appear on the list, ranked highly with the best nightlife and restaurants, great shopping and attractions/activities, but fell from grace thanks to its dirty streets, high prices, and unfriendly taxi drivers. Somewhere in Midtown, a woman in a cocktail dress on a crusty corner is hailing an expensive cab, driven by a crusty cabbie. For more chipper taxi drivers, head to Dubrovnik. And for better attractions, forget Paris, which earned third place in that category, and go to Rome. And if orientation and directions are a problem, Vienna was voted the easiest place to get around. Unsurprisingly, Dubai -- land of gold iPad-laden, seven-star hotels -- topped the list for the world's best city for hotels and shopping. But those familiar with the Emirati metropolis would agree with its third-worst ranking for culture. And more frugal travelers should visit Budapest, which offers the most bang for your Euro. 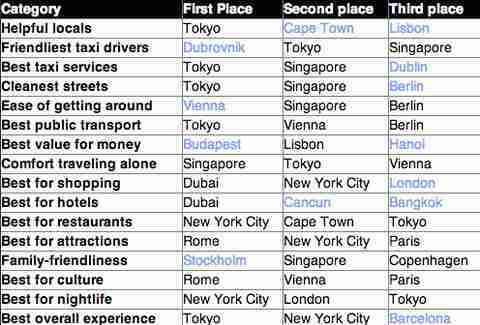 The survey's findings see Moscow, Mumbai, Marrakech, and the Dominican Republic's Punta Cana dominate the lowest rankings, for collectively being awful at everything -- from public transportation and tolerance with tourists, to bad service from taxi drivers and hotel staff. Check out the results for win, place, and show below, and head here for the full results. Chloe Pantazi is an editorial assistant on Thrillist's travel team. She has been that woman in the cocktail dress in Midtown many a time. Follow her to the subway on Twitter at @ChloePantazi.